Just how much does William Jennings Bryan College charge for tuition now, and how much is tuition estimated to change? How does tuition compare to the average? Keep reading to find out. Be prepared economically for your degree. Compare Bryan College - Dayton's fees and tuition to other U.S. colleges. Check for price developments and increases to see if you should budget for more money for the next four years of paying for college. How do Fees & Tuition at William Jennings Bryan College Compare to Other Schools? The subsequent table outlines how William Jennings Bryan College measures up to other schools nationally, regionally and by state. How Much Will Tuition & Fees Be for William Jennings Bryan College? In the 2017 - 2018 academic year, full time students at William Jennings Bryan College were billed $25,600, before modifications for financial need. From this total, the expense of tuition was $25,600. In contrast to public colleges, William Jennings Bryan College does not provide a tuition discount to in-state students. Bryan College - Dayton tuition and fees is the sum charged to undergrads for one academic year, and does not include room and board. Then again, most students end up spending under full tuition after getting financial aid along with other rate reductions. How much does William Jennings Bryan College cost part time? 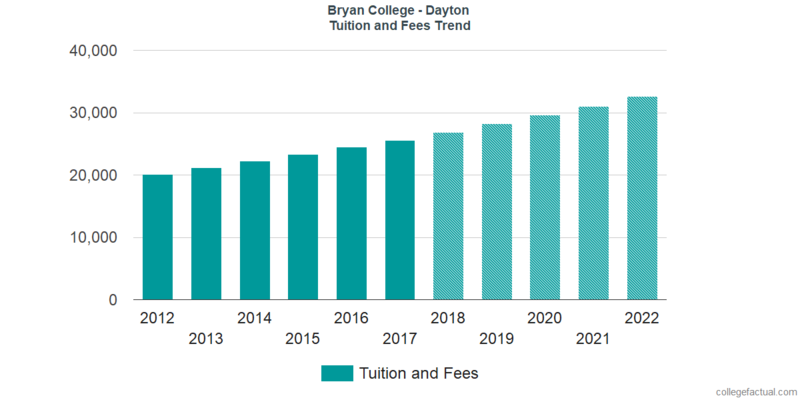 There has been a rise of 5.0% in Bryan College - Dayton tuition and fees for out-of-state students in the past 5 years. Tuition grew by 5.0% and fees grew by 0.0%. This year, undergraduates should expect to pay $26,867 based on current estimates. Because of price increases, the full cost of a four-year degree from William Jennings Bryan College will be $115,715, and the full expense of a two-year degree would be $55,064, which doesn't include additional expenses for books, transportation, and room and board. Look at this next chart to discern how William Jennings Bryan College tuition and fees may develop in the future. Pay attention to how much college fees and tuition is growing annually. At a lot of schools students will end up spending more on their final year of college compared to what they did for their first.